"Hmm. Not good. I totally feel you on the lack of stable job situation thing. It's like living in a continuous, luminous, putrid green stress bubble." The best parts of this are that Office Robot is in it (YES. He is so understanding and sensitive. He knows when to be there for us. Even though his feelings are manufactured.) 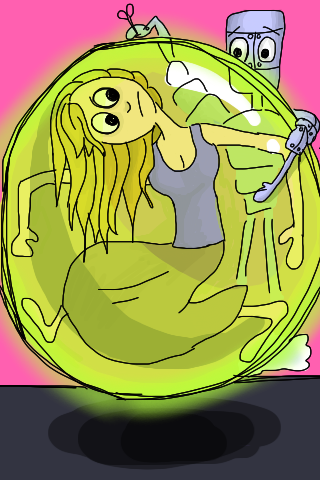 and that the bubble is luminous. The bad parts are the rate of unemployment amongst my friends at the moment (Including me! 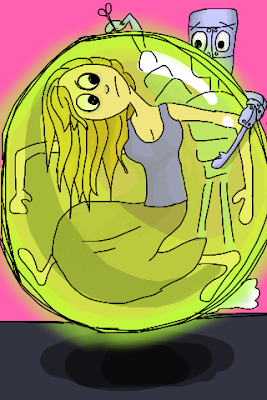 Yes, That Terrible Job is over) and that we can't tell if Office Robot gets Allison out of the stress bubble or not. I think he will.... but he may spend some quality time stabbing futilely at the walls before he breaks through. I`m trying not to be critical, but maybe if he got a better grip on those scissors, it would be easier. I am also not referring to myself as Allison for fun. This may look a lot like me, and in fact, people refer to Allison and I interchangeably. We are both unemployed, with similar hair colours and body types but I am sure you KNEW this was not me or the Not-Twin because she has longer hair and no glasses. I accept your nods as assurances that you were not for even one moment confused.